Just before noon I came home with cheese bread and bagels, and then for lunch my dad fixed me a big bowl of beef noodle soup. Good trade! 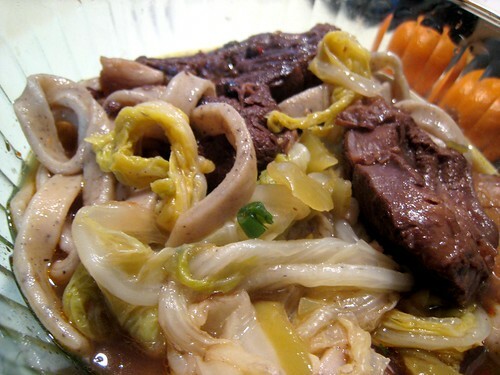 Cabbage, chunks of braised beef, pickled mustard greens, and homemade noodles all floating in a savory beef broth, with a sprinkling of scallions on top. Plus a dollop of chili-garlic sauce for good measure. Yes, please. It's really the noodles that do it for me. My dad rolls out a stiff dough and cuts out thick strips to make these extra-chewy noodles; this time he added some ground black sesame seed, which accounts for the speckles. Beef noodle soup is awesome, but I never can resist also having the noodles on their own, simply tossed with a little oyster sauce and sesame oil. 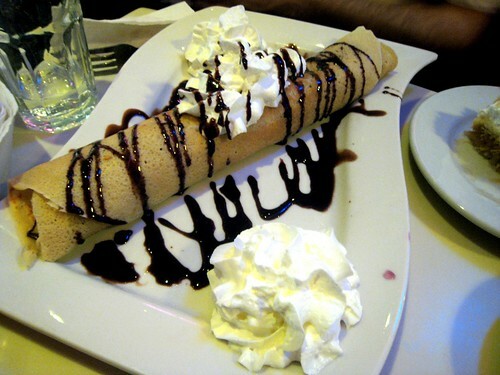 I could probably eat that all day. 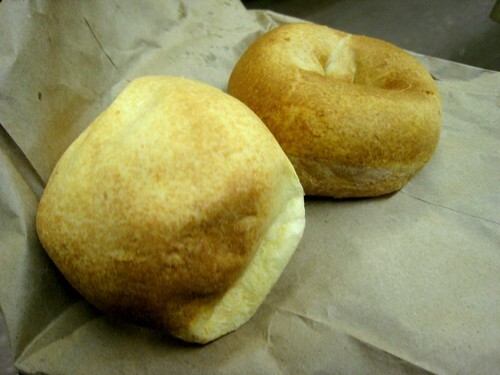 Along with the pandebono, I also picked up a few bagels from Brooklyn Bagel & Coffee Company (warning: music plays on the site), another favorite place of mine in Astoria and located a few blocks away from La Casa del Pan. 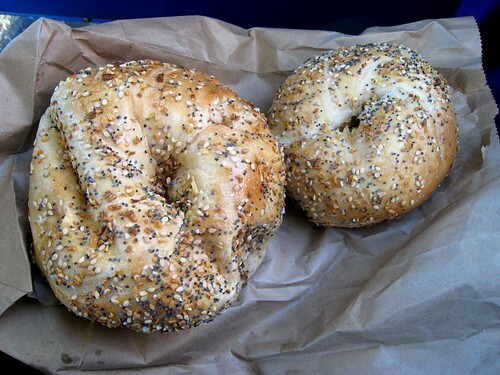 Their bagels are definitely of the oversized monster variety poo-poo'd by bagel purists, but I love them anyway—even as much as the ones at Hot Bialys, though they are very different specimens. I bought a few of the onion and everything bagels and also got a "mini" everything bagel. You can see the difference in size above. What's amusing is that when I weighed them on a food scale later, the mini size came in at around five ounces—a hefty number when you consider they only used to weigh about three. And the "normal" size was just under eight ounces: nearly half a pound! 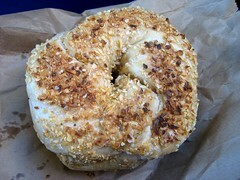 The bagels from Brooklyn Bagel & Coffee Company are generously covered in toppings, slightly sweet, and very chewy. The crust color tends to be a little pale. And like I said before: they're massive! I'm sure there are those who are horrified by this description, but for me it's just right. My parents agreed, too. 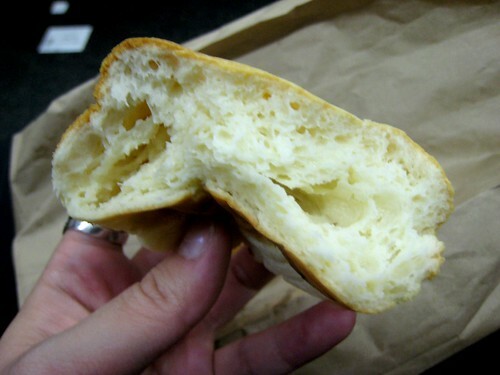 I didn't discover the wonder of pandebono and pao de quieijo—cassava and yucca based cheese breads—until I lived in Astoria. Though the area is best known for its Greek population, there are also plenty of Bangladeshis, Arabics, Brazilians, and Columbians; it was in the bakeries of the latter two that I finally came across these delicious creations. 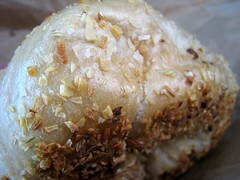 The very first was at the small Columbian bakery La Casa del Pan. I wandered in one afternoon while exploring the Steinway area shortly after moving into my apartment. As soon as I bit into the pandebono, I was hooked. The combination of thin, slightly crisp outside, fluffy and super-moist inside, and warm, cheesy flavor was perfect to me…I couldn't believe it had taken me so long to discover them. I started dropping in whenever I passed, and once I made BH swing by before driving me home so that I could pick up a bunch to bring back to my parents. He waited in the car while I dashed in, and I came out triumphantly bearing a sackful that had just recently been in the oven. Their fragrance was divine. Right there in the car, we dug in. The warm, savory insides nearly melted in our mouths, and we went through three of them before stopping ourselves from eating the rest. Back in the area again several weeks ago over winter break, I had to pick up a few. 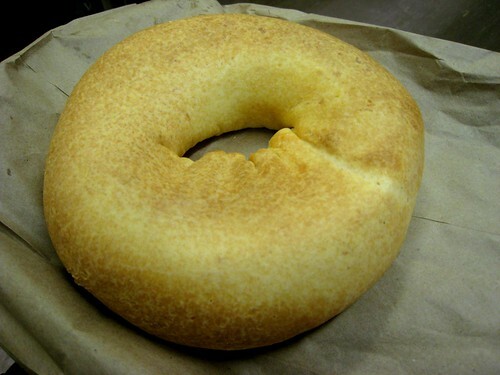 La Casa del Pan sells cheese breads in three different shapes: a round, puffy bun; a small, flatter ring; and a version of the ring in a larger size—it's all about the ratio of the crust. 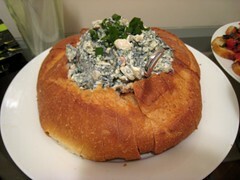 With most bread I like the innards the best so I'm partial to the non-ring version. I got three, ate two, and saved the big one to bring home for my parents. 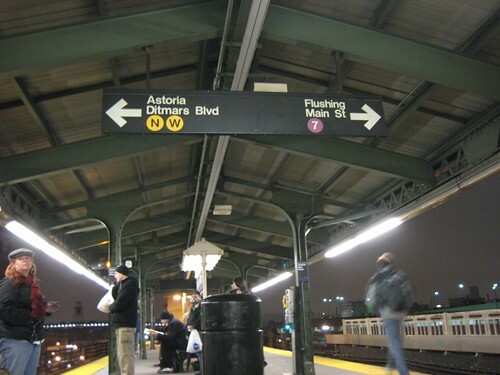 I may not live in Astoria anymore, but some habits still remain the same. 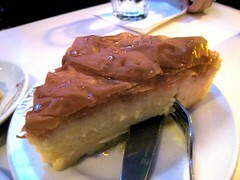 After our meal at Zenon Taverna, we were all in the mood for something sweet. 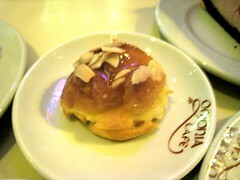 It was off to Omonia Cafe, which I used to pass all the time. Their claim to fame is being the bakers of the wedding cake in My Big Fat Greek Wedding—which is proudly announced via a poster taped to their front window—and they had always seemed busy whenever I walked by. I'd picked up some cookies for takeout from Omonia before, but I'd never sat in their cafe area. The atmosphere is amusing in the way most of the Greek cafes in Astoria are amusing: color-change neon lights, guido clientele, and a clubby feel. Despite the giant meal we'd just consumed we ended up getting six desserts, just because there were so many enticing items in the cases. LB and JL in particular were keen on trying them all, and I daresay they led the way in our sugar gluttony! Clockwise from top left: tiramisu; ekmek kataifi, a honey-soaked block of wheat shreds topped with whipped cream and almonds; cream puff; and galactoboureko—one of my usual favorites—custard cream between layers of phyllo. This last one was a bit starchy and heavy, but I liked it anyway. 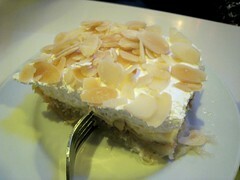 The rest, which were not as sweet as many Greek desserts can be (a very good thing), tasted fresh and were quite good. 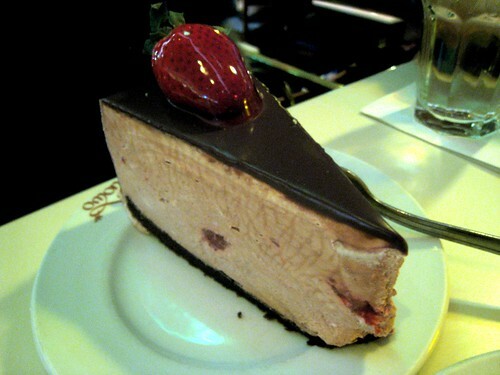 My favorite, though, was the mousse cake with strawberries JL picked out. 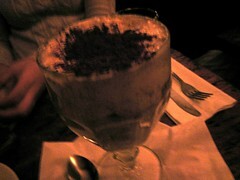 The texture of the chocolate-flavored mousse was dense, but it melted once in the mouth and felt quite light. I liked the chunks of fresh strawberry scattered throughout, and the thin layer of chocolate on top was a welcome extra dimension. The crepe component of the "Berry Blue" crepe TL ordered was chewy, but I didn't mind. The winning combination of Nutella and banana was made even better by the addition of syrupy cherries and fresh blueberries, and I enjoyed it quite a lot. Omonia has better than average offerings and good portion sizes, and I'd be down to go there again the next time I'm in the area. 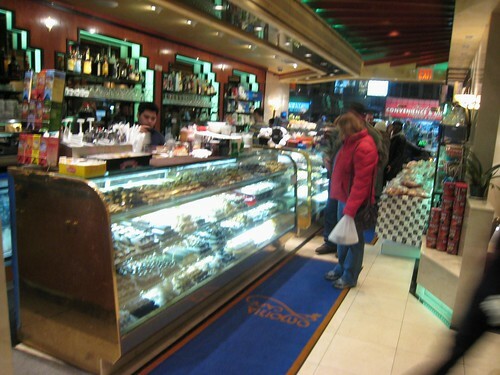 That dessert case had a lot of other items I wouldn't mind trying…. I didn't even know what was coming. I returned from Zenon Taverna's bathroom in the basement to learn that while I'd been gone, my companions TL, LB, and JL had ordered two sets of the meze for us all to share, one fish (psaromezedes, at $18.95 per person) and one meat (kypriaki mezedes, at $21.95 per person). Either meze requires a minimum of two people ordering it, so for the four of us this decision was perfect. According to TL—who had suggested Zenon Taverna after going there with a different group—we were in for a major Greek-style feast. 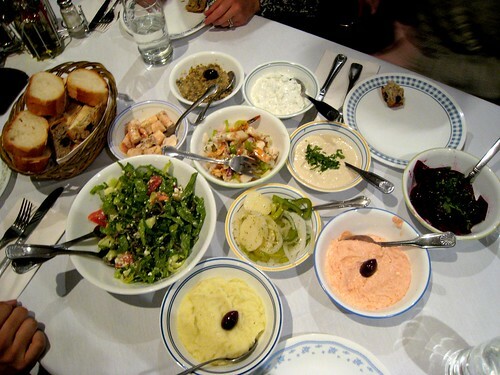 Both mezes come with a set of cold dips and appetizers; by combining the fish and the meat meze, we were able to check out the full arsenal. Both come with a fresh green Cyprus salad of romaine, cucumbers, tomatoes, onions, feta cheese, olives, and caper leaves (on which I found sharp thorns! ); scordalia, a garlicky, lemony potato dip; tarama, another lemony potato dip but with red caviar mixed in; a beet salad dressed with olive oil and vinegar; and a seafood salad with squid, crab, shrimp, and celery, again with olive oil and vinegar. The octopus salad—same as the previous but made solely with chunks of octopus—and the salad of boiled potatoes and green peppers dressed in olive oil and vinegar came out as part of the fish meze, and with the meat meze came tzantziki, a yogurt and cucumber dip; melitzanosalada, an eggplant dip; and a dish of tahini, a rich sesame dip. Everything came out at once, along with a basket of assorted breads and warm strips of pita, and I felt immediately overwhelmed. There was too much to eat, too much to try! After a little while though, I began to see that most of the salads had been dressed the same way, in olive oil and vinegar (if you hadn't gathered that already from the descriptions above), and many of them were much too sour and acidic. I found myself gravitating towards the ones that weren't, such as the tzantziki and the melitzanosalada, or pairing the more acidic salads with tahini as a creamy antidote. Don't get me wrong, I enjoyed myself immensely, but I definitely had to eat many of the dips and salads with something creamy and/or pita bread in order to alleviate the vinegar sting on my tongue. We spent a while making our way though the cold appetizers, and then the hot dishes started coming out, seemingly also in a flood. 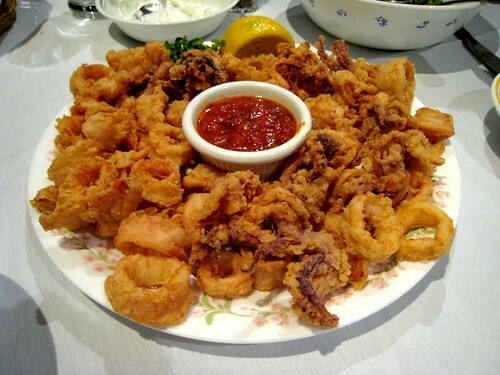 Among the first to arrive was this beautiful plate of fried calamari, which was hot and crisp and just greasy enough. It was one of my favorites, and I'm glad there was plenty of it. 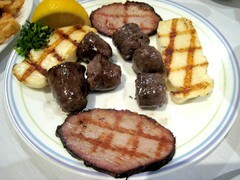 On the left, grilled halloumi, smoked pork loin, and chunks of "Cyprus sausage." On the right, the "Cyprus meatball." I liked the meatball the best; it was juicy and flavorful, almost like the filling of a Chinese pork dumpling, shaped into a log and dropped into the deep fryer. The grilled halloumi was good while hot but complete rubber once cold. 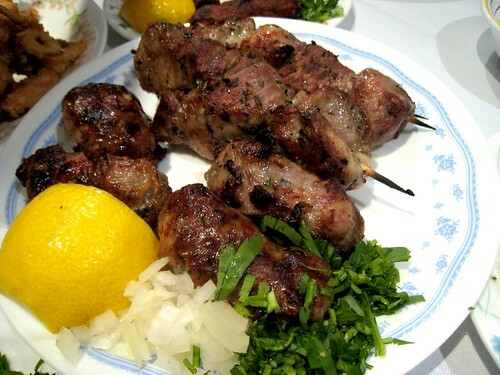 Souvlaki and sheftalia: the former, chunks of grilled pork; the latter, grilled pork meatballs. Again I found myself liking the meatballs the best—these weren't dissimilar to the ones above, though they were grilled instead of fried. 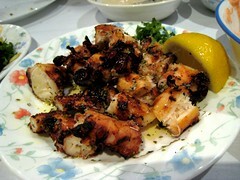 Char-grilled octopus, squid, and enormous shrimp; pieces of quail. 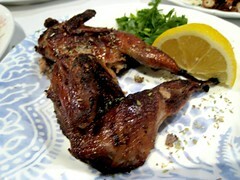 The seafood dishes were good although a bit uniform in preparation and taste, and the quail was decent. 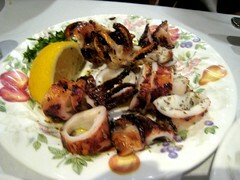 As with the halloumi, once the octopus and squid chunks cooled off, they turned pretty rubbery. The key with this meal is obviously to eat fast…an impossibility considering the rate at which the dishes arrived. 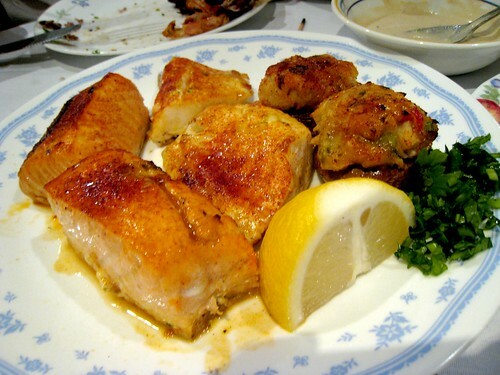 The last dish to come to our table was a platter of broiled salmon, broiled (unknown species) white fish, and stuffed mushrooms with crabmeat. The salmon tasted just a bit fishy and the other fish was overcooked, so after we sampled them the fillets went mostly untouched. And neither LB nor TL like mushrooms, so it was up to the ladies to polish them off, although both of the men tried some of the stuffing inside. I had a good time with this meal, although more for the feeling of bounty and surprise (what's coming to the table next?) than for the food. While I liked many of the items that came out, others were a pass. It's a great way to try out a lot of different things at once, though, and it's fun to do with a group. For the price, it's not a bad deal for the experience. I'd never eaten at Papatzul before, so when I read the laudatory review on Serious Eats I was excited to meet up with AT at a new place. Yet as soon as I walked in, something felt familiar. It wasn't until I opened the short, curved door to one of their restrooms that I realized why: I'd once had several cocktails on a date at this address, years ago when it had been a bar with pool tables instead of a restaurant. New York City just never stays the same. The switch to Papatzul was a positive, in my opinion. Not that the bar had been bad, but because the food at Papatzul is worth trying. 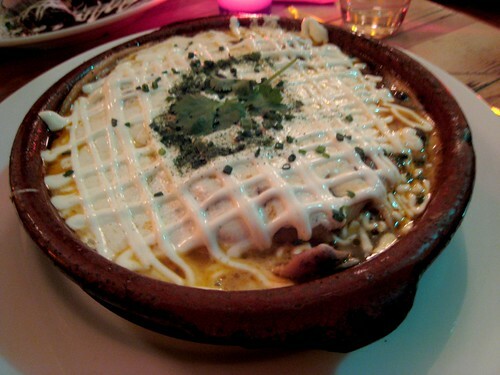 My order of the budin al pasilla, a layered casserole of corn tortillas, shreds of chicken, melted cheese, and creamy whole beans, with a crosshatch of crema over the top, was uncomplicated comfort food, soupy around the edges at first but then as it cooled, a hearty delight to sink my spoon into. The flavors and spicing were well-balanced, if just a touch on the salty side. 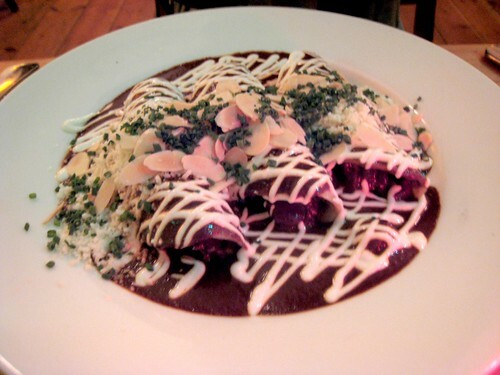 AT's duck enchiladas in mole sauce were also good, judging from the bite I took. Considering that she cleaned her plate I'd say she also gave it a thumbs up. The prices were neither cheap nor egregious, and the food was solid. With the night frigid and the place nearly empty, AT and I didn't linger for very long after our meal—sitting around in a barely filled restaurant always feels awkward to me. On a busier day with just a few more tables occupied around us, though, we probably would have. After all, I have some fond memories from the place. More often than not, when I look at a menu from a Chinese restaurant, I find typos. Not to say that non-Chinese restaurant menus don't have errors, because they do. But I notice it often in Asian places because they tend to be the most hilarious. Take the printed menu from Fu Run, in Flushing, as an example. In addition to the "sliced photo w. special sauce" and "sliced of stomach in hot oil" you see above, there were also "deep fried bondless spare ribs" and "braised rips" on offer. Not to mention "seafood w. blotch soup." I spent the first ten minutes laughing at the menu and then poking my dad to make him read me the Chinese names. In some cases, there was no other way to figure out what the dishes really were. 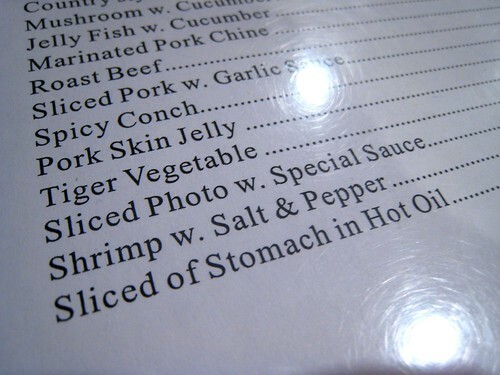 But I still have no idea what "sliced photo" is. I was at Fu Run with my family after my parents had gone ballroom dancing all afternoon (one of their frequent amusements). My brother had suggested the restaurant after reading about it on Chowhound, where it was first discussed when it went by the name "Waterfront International." Now it only goes by a Chinese name which has been translated to English as "Fu Run," though reviews for Waterfront International still sit in the window. From what I've gathered the menu has either remained the same or is very similar. I let my mom and brother do all the ordering, as I was too busy giggling over the menu. 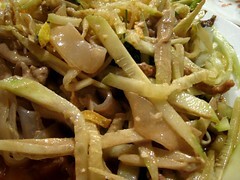 Fu Run has a lot of specialties from the Northeast region of China, and they picked out some of the more unique ones, such as the above dish of "country style green bean sheet jelly," a refreshing cold mung bean noodle salad with shreds of pork, cucumbers, carrots, and wood ear mushrooms tossed in peanut sauce and a final drizzle of wasabi oil. The zhajiang mien we ordered was disappointing, making the just-okay jajangmyeon I'd had recently seem awesome. 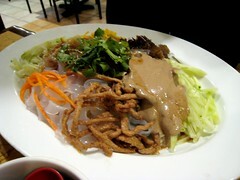 The noodles were too soft and the sauce just tasted oily. Two other dishes we had, though, packed strong flavor punch: the "shredded pork stomach in fresh hot pepper" (on the left) and the casserole of pork with sour cabbage and pig blood cake (on the right). 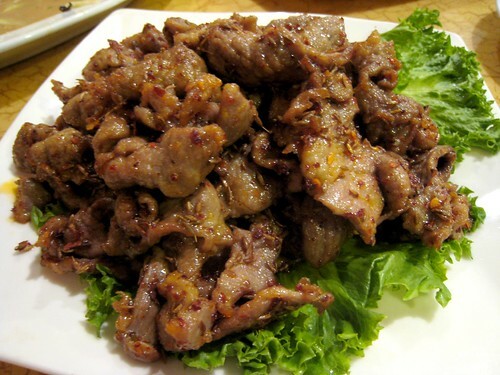 With its crunch of barely sauteed hot peppers and chewy shreds of pork stomach in a salty sauce, the former was definitely the kind of dish you call xia fan. 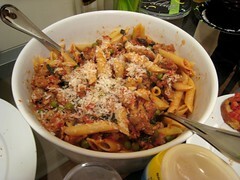 The sour, meaty casserole was hearty and warming in the belly. 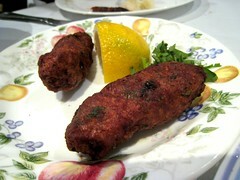 My favorite dish of the night was, hands-down, the crispy lamb in chili pepper. While it wasn't particularly crispy, I found the pieces of meat tender and chewy at the same time as well as redolent with a rich array of spices, the strongest being toasty cumin. It was a little gamier than usual—the fat in lamb, I think, is what holds the funkiness—but that's also part of why I couldn't stop sneaking pieces of it into my mouth. We had ordered a lot of food for four people but still couldn't pass up the opportunity to get dessert, which in this case was the "mixed sweet delights" dish of taro, sweet potato, apple, and banana. 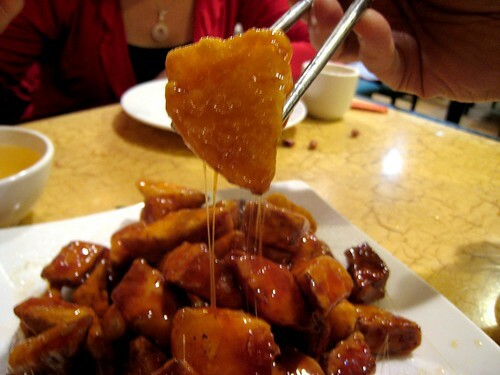 The pieces of fruit and potato are deep fried and then tossed in sugar, which caramelizes into a rich syrup. When you pull off a piece, gooey strands follow your chopsticks until you plunge the piece into a bowl of ice water, whereupon the sugar instantly hardens, creating a crisp candy shell around a hot center. Fun! Despite the description on the menu our plate didn't seem to have any banana; I wasn't as fond of the apple, so I stuck mostly to the taro and sweet potato. Next time I'd probably just order the taro, as it was my favorite and cost three bucks less for the same amount as the mixed version. Fu Run had a bunch of specials written in Chinese on the wall, which none of us noticed until after the meal. Too bad—it's not often that I eat out with my parents (we're more about the home-cooked feast) and so I won't be able to have them translate should I return. With so many unique offerings on the menu, I wouldn't mind going back to explore. The Feisty Foodie and I have "known" each other for a while now—years, even—but not in real life. Despite having an alarming number of friends in common (thank you, Facebook), Yvo and I never met in person until several weeks ago, when we finally got around to having dinner. Having read one another's personal blogs before either of us had even started food blogs, it was interesting to talk to someone new while feeling like I already knew the person. I suggested Max because I was still in the mood for warm, comforting grub, and I remembered really enjoying the food at this Italian restaurant. The last time I had come was for a birthday dinner a few years ago, and while the long wait, indifferent service, and cramped tables were annoying, it had been worth it for the fresh pasta dishes, which were delicious and affordable. I was curious to see if the place had changed or remained the same since. It was still cramped, but there was no wait (it was Monday night, on the early side of dinner service). 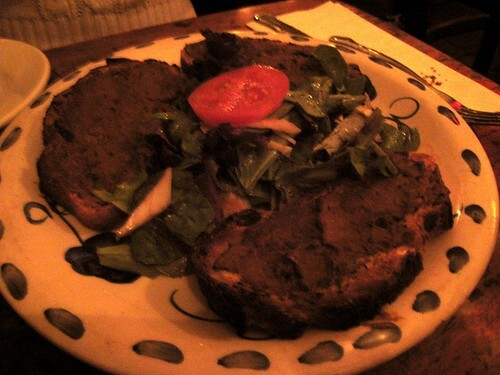 As we crammed ourselves into a tiny table space in the back and perused the menu, I was excited when Yvo mentioned eyeing the liver toasts as an appetizer, since most people I eat with turn their noses up on the stuff. They came out hot, though, which made the liver spread seem kind of…dank. I ate them, but I wasn't that enthused. 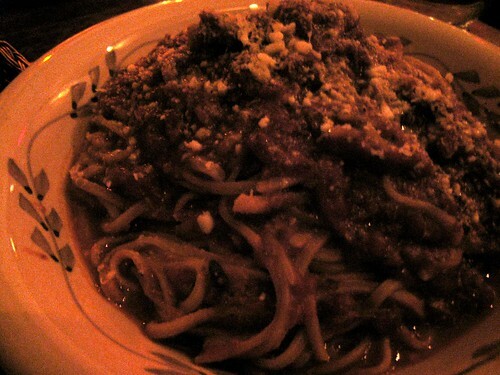 Despite its unappetizing appearance in this photo, the spaghetti alla chitarra was good, a rich, salty lamb ragu over fresh pasta. The soft, chewy strands began to clump together as it cooled down, though, and by the end it was more like I was pulling off bits of spaghetti to wrap around my fork. I probably should have tossed it thoroughly with the sauce before I began eating. I do feel like I would have liked it even more if I could have seen more clearly what I was eating. Not just for the sake of photography (which as you can see, was shite) but because for me the appearance and presentation of food is part of the enjoyment. The place was romantic, yes, but come on. Our meal practically required flashlights. Yvo had started smiling as the server went through the dessert list, and after he left she explained why. 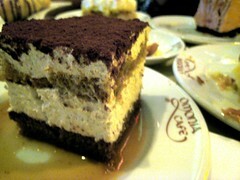 Panna cotta and tiramisu were her two favorite desserts, she said, and now they were both on the menu! So of course we ordered both. I liked the tiramisu; it was dense and full of cake/lady fingers, which for me was a good thing, although I believe Yvo felt otherwise. 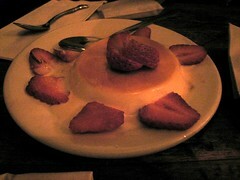 The panna cotta struck me as being too milky and sticky, though I'm not really sure what a proper panna cotta is supposed to be like. The portions were large, but they also each cost around eight bucks, which makes it just okay, I guess. My experience this time has made me cool my affections a little bit toward the place, but not because Max has gone down in quality. Actually, it seems just the same, but now I realize that it's an Italian place on the decent end of a lot of other, similar Italian places. It is cozy and romantic, though, so it's a good choice if you're looking for a date spot. TL and I were both pretty full from Shanghai Mong, but after a long afternoon of walking around, running errands, hanging out at Starbucks and Borders, and seeing Slumdog Millionaire, it was time for dinner and both of us were at a loss. Nothing in particular called out, and even the suggestion of going home and ordering something didn't spark up an appealing fallback. On the N train headed to Astoria, we were almost at the stop for TL's apartment when I remembered the Czech place a block away from the 30th Avenue station. "Zlata Praha," I said. "Let's go there." 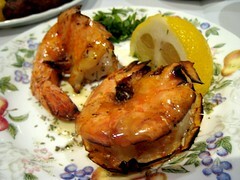 I'd been wanting to try the restaurant for a long time, and so had TL; both of us had heard good things. A friend of mine had called it one of the most authentic Czech places around. Despite its slightly forbidding exterior (no windows aside from two covered by curtains), the interior was welcoming and Czech tchotchkes lined the walls. A quick look at the menu revealed that in February the place was also organizing a "Czech and Slovak Ball" at the Astoria World Manor as well as hosting a multi-day "Venison Feast" in the restaurant. Too bad I was leaving before then! 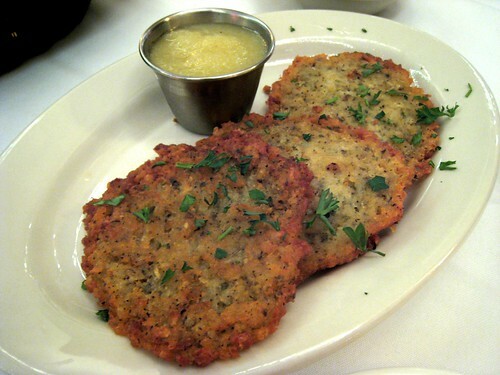 Both of us had spotted the potato pancakes on the menu, and I'm glad we ordered them. 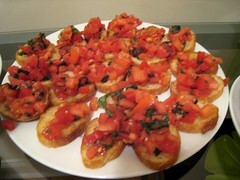 They were crisp all over and pleasantly chewy in the centers, with an uncommon lightness and great flavor. 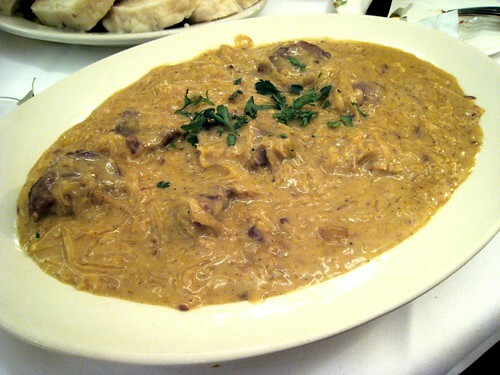 I had the pork goulash, which was rich with sour cream and thick with sauerkraut. 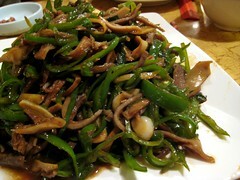 The pieces of pork were perfectly tender. This one definitely fell into the comfort food category. 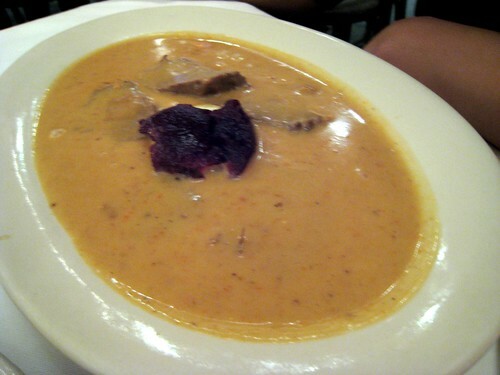 TL ordered the bohemian sauerbraten, slices of roasted beef in a sweet, creamy sauce that TL commented was almost like a pumpkin or butternut squash soup. Dollops of jellied cranberry sauce sat on top, and I couldn't help dipping from time to time into his dish, too. If you thought both of our entrees look mainly like plates of sauce, you're be correct. 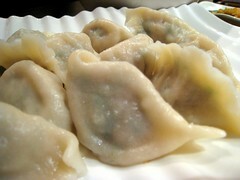 Luckily, a large plate of "dumplings" came out with them—and these weren't dumplings like any I'd seen before. 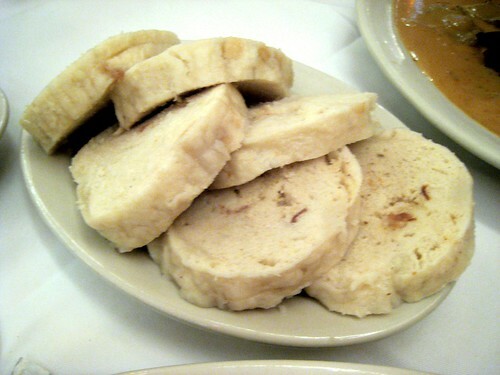 Instead of little parcels of meat and dough, Czech dumplings are sliced rounds of fluffy steamed bread, unexpectedly similar to mantou. They made a great foil for the rich, creamy sauces and sopped up the flavors nicely. Afterward, we were stuffed. I wish I had gotten around to trying this place while I was actually still living in Astoria, but I guess it's just as well, since its offerings aren't light fare. If you're seeking something hearty and warm in cold weather, Zlata Praha is the spot. 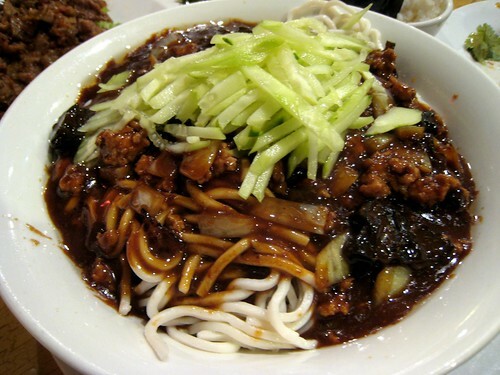 Korean-Chinese restaurants are usually frequented for a few specific dishes: tangsuyuk, a version of sweet-and-sour pork; jjamppong, a spicy noodle soup with an alarmingly red-colored broth; and jajangmyeon, above, a noodle dish kin to the Chinese zhajiang mien. 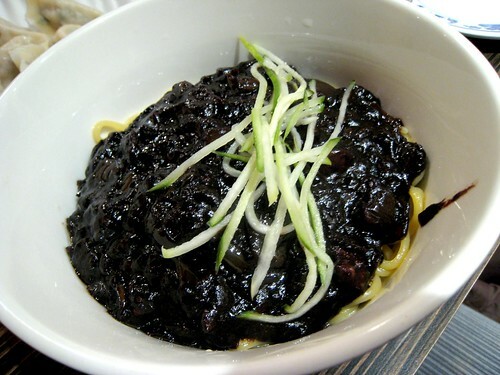 Typically the sauce for jajangmyeon is gloppier in texture—in a good way—and it is not sweet like Chinese versions that have hoisin sauce in the mix. One of the primary ingredients is a paste of roasted soybeans, which gives the sauce its dark, almost black color; there's also pork and/or bits of seafood, and lots of soft, slow-cooked onions. 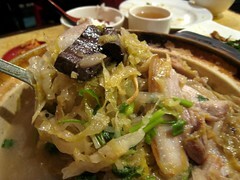 It's served alongside kimchi, pieces of raw white onion to dip in vinegar, and yellow half-moons of takuan. A person who's only eaten the Chinese renditions of tangsuyuk, jjamppong, or jjangmyeon might find these dishes all very familiar, but also distinctly Korean. For me they are different items altogether. I had the above bowl of noodles with TL at Shanghai Mong, which is one of the more popular Korean-Chinese restaurants in K-town, and thought it was okay. It satisfied my craving, but in the end it sort of lacked oomph. I think there are better places for this dish out there. 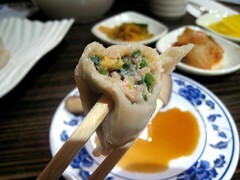 I enjoyed the boiled dumplings we ordered, though, which were plump and filled with pork and chives. We had gotten them as a side dish/appetizer but TL commented later that there was enough in one order to constitute a meal. He was right—I could have foregone the noodles and happily scarfed them down instead. Like me with my blog posts, my friends are tardy. Tardy with gift-giving, that is, seeing as how we didn't hold our Secret Santa exchange until nearly two weeks after Christmas had passed. SH generously offered to host the twelve of us at her apartment, and she even made all the food. 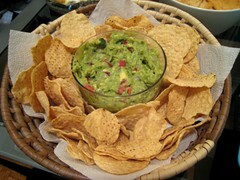 Above, guacamole and chips; bruschetta; artichoke and spinach dip; pasta with sausage and peas. Let me just say, SH is excellent at fixin' up grub. 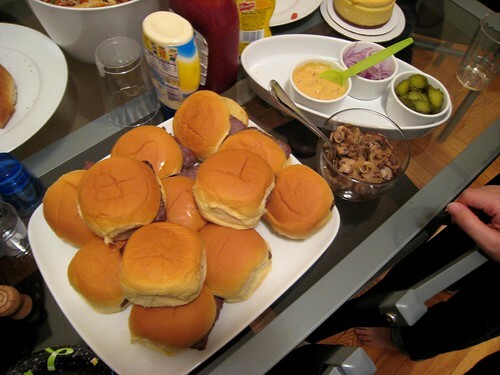 She also made mini burgers with red onion, pickle slices, caramelized onions, and homemade chipotle mayo to top 'em with. Plus a huge crock of Swedish meatballs, which I didn't catch a photo of. For dessert TC had picked up three darling little cakes from Two Little Red Hens: red velvet, chocolate, and cheesecake. 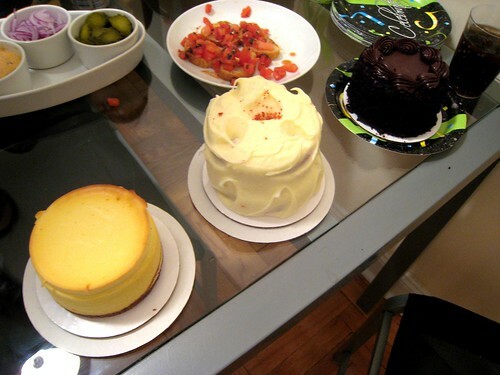 The last was softer and fluffier than I liked (I prefer cheesecakes denser), but the other two were pretty good, really heavy on the frosting, which is probably a thumbs-up for many. 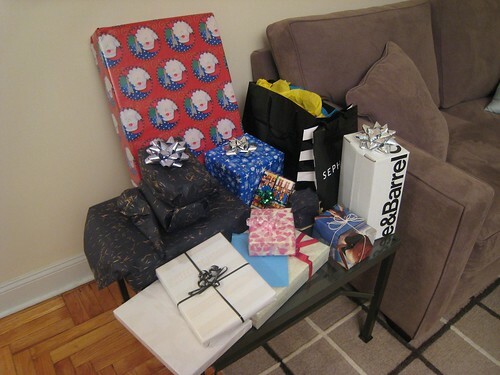 Then it was on to the gift exchange. Among the food-related gifts swapped this year were a tabletop burner and hotpot/shabu-shabu kit; a maple-wood cutting board; a fondue set (for me); a giant variety-pack of snack-sized chip bags; a set of scotch glasses along with a nearly empty bottle of Glenlivet; and breast milk from a Cambodian immigrant. A pretty good—if questionable—hoard, if you ask me. Say what? you're thinking. Breast milk? Cambodian? Um…you don't want to know, okay?